The Nigerian senate committee members has concluded and now has Considered Scrapping Of 2017 Post UTME. The Senate is considering removing Post UTME. Lawmakers complained that it was unnecessary problem for students. 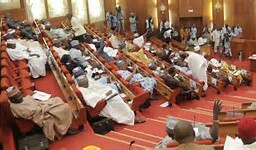 They noted that it was difficult getting university admission in Nigeria The Nigerian Senate has considered scrapping the post University Tertiary Matriculation Examination (UTME) describing it as unnecessary stress, The lawmakers on Tuesday, October 3 the lawmakers said the Joint Admission and Matriculation Board should be the sole exam for gaining admission into tertiary institutions. Arrested terrorist Senator Umaru Kurfi in a motion called for the scrapping of the post UTME. Senate leader, Ahmed Lawan, who also spoke on the motion, said candidates should get admission after passing the UTME. He said: “There is no need for this test. If we say we believe in JAMB, then, there is no cause for setting up a Post-UTME test. It amounts to stress and unnecessary financial requests. “After JAMB, they go ahead to set up tests as if the one conducted by JAMB is not of standard. We must ensure that JAMB’s test is the only way to secure admission. ” Senator Shehu Sani who also contributed to the motion said it was harder getting admission in Nigeria compared to foreign institutions. He said: “Our concern is the fact that after JAMB is post-UTME. That becomes a series of hardships and sufferings on the way to university. The problem we are facing is peculiar to us. It is easier for a Nigerian to secure admission outside this country than it is here. The lawmakers called on the Senate Committee on Tertiary Institutions and TETFUND to meet with other partner to make a way forward. Meanwhile, JAMB said before offering any student admission it would demand for the records of Ordinary and Advanced Level results of candidates recommended by tertiary institutions. Prof Ishaq Oloyede, the registrar of JAMB said this during this year’s meeting on admissions exercise/processes for Innovative Enterprise Institutions in Abuja on Tuesday, September 26.